The offshore industry is in direct dependence on the global oil prices which have been extremely volatile for the past few years. In September 2018 they hit a 4-years maximum of $81.2 per barrel after the OPEC promise to keep its production steady; and then in less than two months crude oil prices perform their latest somersault and drop for almost 20%. Experts explain that phenomena by the slowdown in the economic growths and consequent drop in the fuel demand especially in China that used to consume 12% of oil products produced around the world. However, this sinking of the prices is mainly attributed to oversupply in the market that only swells due to US shale oil production and other players’ reluctance to cut back excavation of hydrocarbons. Meanwhile, analytics avoid painting a gloomy picture for the Oil&Gas Industry. It seems that the market has adjusted to the constantly changing conditions; so it is forecasted that the average price for the crude oil in the 2019 will constitute $72 per barrel, while in 2025 it will reach $85,7/b. In this context offshore ship owners have to adapt constantly and plan their development strategies with utmost care to remain in black. However, this does not mean that some big projects are laid aside and spectacular vessels’ delivery would never happen. Offshore industry is still determined to set records. Oil majors tired of kidnapping, corruption and oil theft that are thriving onshore and in near coastal production in West Africa have started looking out for safer deep sea oil fields. Luckily, Nigerian offshore has some treasures to offer. Among them is Egina an ultra deep oil field that soon will be developed by one of the biggest FPSOs ever built and surely the first such project completed in Nigeria. The Egina FPSO was built by Samsung Heavy Industries. 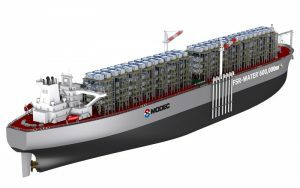 South Korean ship yard has done the bulk of the works; and then she sailed to Lagos where the topside constructions have been planted. The total cost of the newbuild project is worth more than $3.4 billion. The parameters of the newbuild beauty are truly amazing. Egina has 330m in length, 61m in breadth, and 34m in height. It is expected to produce 200.000 barrels of oil per day upon its commissioning by the end of 2018. 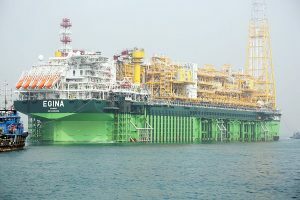 The production from Egina oil field (130 km off Nigerian coast, 1400 – 1700 m below sea level) will increase this country’s oil output by 10%, so the project is huge for the national economy as well as for the FPSO operator, French company Total S.A.
Another winner from Egina FPSO commissioning is Aqualis Offshore which has been granted a huge position keeping contract managing the entire procedure (the plan is to spread moor her on 16 mooring lines) and providing position keeping masters. It seems that after some years of a rather indolent oil production Brazil is planning to restore its name in the line of the global oil majors. Country’s state oil company, Petroleo Brasileiro SA, more commonly known as Petrobras has resumed paying dividends and is determined to explore deep water pre-salt oil fields discovered about a decade ago in the Atlantic Ocean. The pre-salt oilfields such as e.g. Sepia are located approximately 200 km offshore from Rio-de-Janeiro and contain large accumulations of light high quality oil under the thick layer of salt. In order to develop these provinces Petrobras is now installing 8 FPSOs and; although, no official target was announced by the company it is expected that production will raise by 9% in 2019 (up to 2.4 million barrels per day) and will gradually double in the coming years. The hiccup in the Petrobras’s operational policy is caused by the presidential elections and consequent changes in the company’s top management. It’s still unknown who will take over the chair of the country’s oil major as Jair Bolsonaro, the controversial President elect, plans to assign new energy team on January the 1st 2019 only. Meanwhile, the company invests in the conversion of 2 more VLCC into FPSOs with production capacity of 180,000 barrels of crude oil per day; 212 000 000 m3 of gas per day; 240,000 barrels of water injection and storage capacity of 1,400,000 barrels of crude oil. Vessels will be installed in Sepia and Mero pre-salt oilfields where the water depth reaches 2.200 m; and the first oil is expected in 2021. Oil will be transported by shuttle-tankers. To sum up, it is evident that new administration plans to take the cream from the long-term investments in the oil&gas and offshore industries of Brazil meaning that after several years of stagnation offshore oil production activities in the region are finally stirring; subsequently attracting investors, contractors and specialists looking for offshore jobs. Another event that is definitely important for the offshore industry is the historic business merger of two US giants Tidewater and Gulfmark on the November the 15th, 2018. 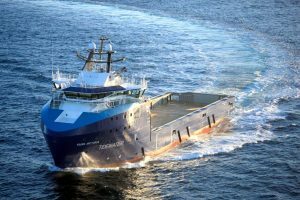 As it has become almost customary for the past few years this is a step of crisis management for both companies; but experts give the newborn holding a positive prognosis since after the merger Tidewater operates the biggest OSV fleet on the planet. There are 273 offshore vessels; with the Total value reaching $1,381m according to VesselsValue web portal. The fleet is in good condition either including PSVs which are chiefly Tier 1 vessels and are below 10 years old. They are mainly DP2 and with a clear deck area exciding 700 m2. AHTSs are below 10 years old too, DP2 and with bollard pull of more than 80t. Also the company is betting on the new- appointed CFO and Vice-President Chief Executive Officer, Quintin V. Kneen, who previously served as CEO of GulfMark Offshore. New Tidewater, incidentally, will be ruled by the former CEO and President John Rynd who kept his post. Another company’s advantage is a well-known Tidewater tendency to scrap away non-performing vessels quite relentlessly easing the market from oversupply and own balance sheet from the burden of expenses. All in all, offshore market is in still in stagnation at present; many owners showing losses. Volatile oil prices are not helping the situation as well. However, vessels are ordered and delivered, oilfields explored while oil drilled and transported, so the industry will be full-swing for many years to come and encumbrances are only temperate.